What does Mobile Growth mean for Advertisers? My phone has now replaced coffee as the first thing I think about when I wake up in the morning. My day starts out by checking email — 3 different accounts, using Gmail app. Open up weather app, check forecast. Go to Starbucks, pay for coffee using app. While the barista was making my drink, use Uber app to order a cab. Arrive at meeting, can’t remember what floor I’m supposed to be on, open up iCal app, check meeting details. Arrive at meeting, hook up presentation, use phone as the remote to control slides. After meeting, check in with team using Slack app. I order a cab back to the office using Uber again. On an average day, before 10am, I’ve already used my phone almost 10 times. Not checked my phone, used my phone. My iPhone is kind of like the adult version of the My Buddy doll. I now have an expectation that the media channels I interact with will be personal, relevant and available when it’s convenient for me. This is why mobile dominates my time. If a brand is able to get on my iPhone home screen — that is the single most effective way to make me a loyal customer. Mobile connectivity is 24/7. The habits we’ve formed and relationships we have developed with our phones has changed dramatically. I remember the days of playing snake and T9 texting — my phone was still primarily used to call and talk, but did not replace my landline or desktop computer. I use my phone now more in an hour than I did in a week back then. The vast growth in the mobile internet since 1995. The population penetration of mobile phones grew from 1% globally in 1995 to 73% in 2014. 2015 will be the year that mobile devices are used more than any other device in the world. 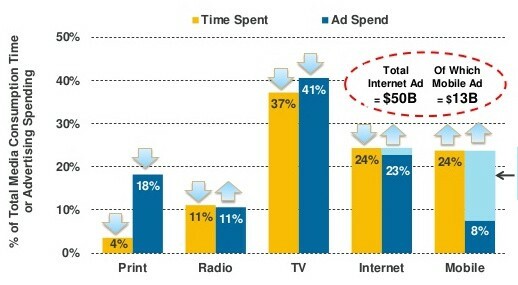 As the industry continues to see a rise in time spent on mobile, advertising format options are becoming more engaging. Pinterest has introduced a video ad that moves as the user scrolls. Facebook has added a carousel ad that allows businesses to put multiple images in an ad that a user can swipe through. Snapchat advertising specs tell brands to use vertical orientation as users are nine times more likely to watch an entire ad because they don’t have to rotate their phone. Although there have been advancements in what advertisers can do with mobile formats, there’s still a huge chunk of money being left on the table. In the latest KPCB 2015 Internet Trends report, they identify $25B opportunity in the US. As mobile devices continue to get more of our attention and integrate with our lives more, we need to consider the role that advertising has. It’s time to target behaviors instead of devices. People’s relationships with their phones are personal. Mass advertising won’t work. If you’re trying to figure out what these mobile trends mean to your brand or if you’re an agency working for clients who want answers, let’s chat. Email or Tweet me. I’ll probably check your message from my phone. Work and play is all the same to me. I frequently mix business with pleasure. Advertising is art. Brands are beautiful. I’ve been social since I was 5.